Informatica Transformations are repository Objects that are used to perform aggregations, sorting, merging, modifying, distributing etc while passing data through them. The Power Center Designer provides a set of transformations in Informatica that perform specific functions. For example, Sorter transformation will sort the input fields based on a specified field. The Informatica transformations can be divided into two types: Active Transformations, or Passive Transformations. We can further divide them based on the connectivity in mapping: Connected Transformations and Unconnected Transformations. An active type of transformation in Informatica can change the number of rows that pass through the transformation. For example, if the input rows do not meet the specified expression then those rows will not move to target. If a transformation does not change the number of rows that pass through it then the transformation is called as Informatica passive transformation. 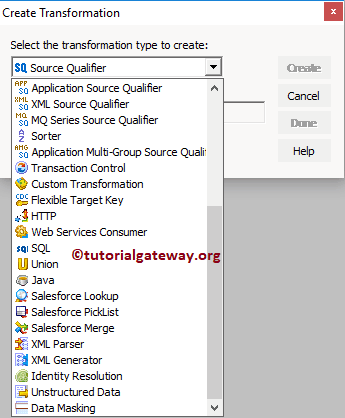 Within a Mapping, if a transformation is connected to other transformation, or if it is directly connected to target table then it is called as Informatica Connected Transformation. Within the Mappings, if a transformation is not connected to other transformation then we can call it as Unconnected Transformation in Informatica. It means, it is neither connected to Source nor it is connected to target. One of the best examples for Unconnected Transformation is Unconnected Lookup. 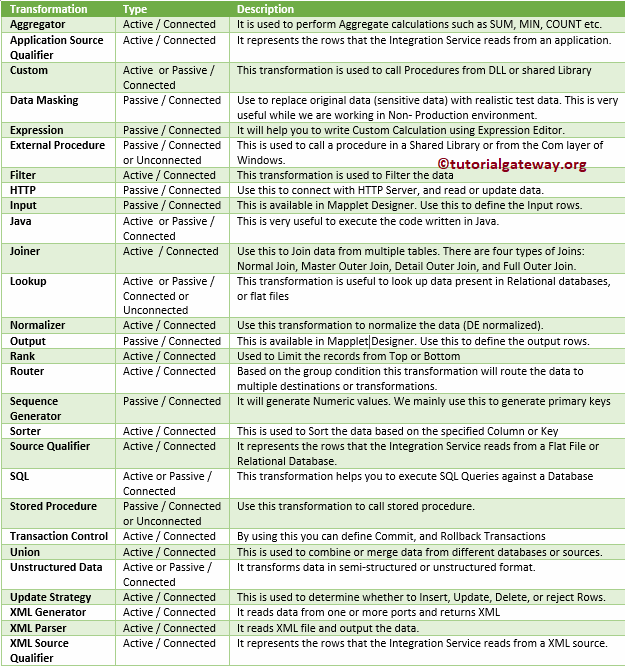 Following are a list of Informatica transformations that are available to transform data. I suggest you click on the URL (red colour links) to navigate to the required transformation and find the example with detailed explanation. Aggregator Active / Connected This transformation is used to perform Aggregate calculations such as SUM, MIN, COUNT etc. Application Source Qualifier Active / Connected It represents the rows that the Integration Service reads from an application. Data Masking Passive / Connected Use this transformation to replace original data (sensitive data) with realistic test data. This is very useful while we are working in Non- Production environment. Expression Passive / Connected This Informatica transformation will help you to write Custom Calculation using Expression Editor. External Procedure Passive / Connected or Unconnected This is used to call a procedure in a Shared Library or from the Com layer of Windows. HTTP Passive / Connected Use this transformation to connect with HTTP Server and read or update data. Input Passive / Connected This is available in Mapplet Designer. Use this transformation to define the Input rows. Java Active or Passive / Connected This is very useful to execute the code written in Java. Joiner Active / Connected Use this transformation to Join data from multiple tables. There are four types of Joins: Normal Join, Master Outer Join, Detail Outer Join, and Full Outer Join. Normalizer Active / Connected Use this transformation to normalize the data (DE normalized). Output Passive / Connected This is available in Mapplet Designer. Use this transformation to define the output rows. Router Active / Connected Based on the group condition this transformation will route the data to multiple destinations or transformations. 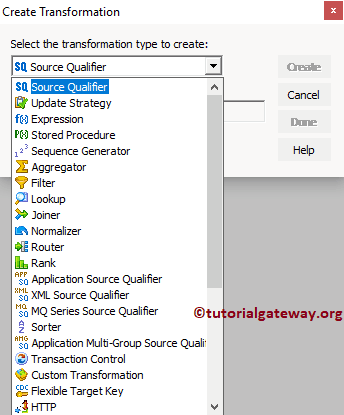 Source Qualifier Active / Connected It represents the rows that the Service reads from a Flat File or Relational Database. Stored Procedure Passive / Connected or Unconnected Use this transformation to call a stored procedure. Union Active / Connected This is used to combine or merge data from different databases or sources. Unstructured Data Active or Passive / Connected It transforms data in semi-structured or unstructured format. Update Strategy Active / Connected This informatica transformation is used to determine whether to Insert, Update, Delete, or reject Rows. XML Parser Active / Connected This Informatica Transformation reads XML file and output the data. XML Source Qualifier Active / Connected It represents the records that the Integration Service reads from an XML source.